Get ready to push yourself to the next level and achieve a competitive advantage unlike anything you’ve ever experienced with Limitless Endurance-RCC. This stimulant-free, jitter-free, scientific breakthrough was specifically designed to improve cellular oxygen*. What does that mean for you? It means you’ll be able to increase your time to exhaustion and avoid “hitting the wall,” which can take you out of the game early. Competitive athletes often travel great distance to train in high-altitude locations, which have less oxygen present in the atmosphere, because it forces their bodies to acclimatize and deliver oxygen to their muscles more efficiently. They believe this then gives them an advantage when they compete at lower altitudes, because their bodies can deliver even greater amounts of oxygen to their muscles. 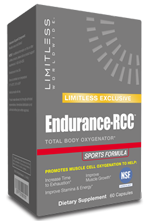 Limitless Endurance-RCC works on a similar principle. It improves cellular oxygen*…. whether or not you live in a high-altitude area. As a pre-workout supplement, take two capsules 1 hour before exercise. WARNING: People sensitive to Niacin (Nicotinic Acid) may experience flushing of the skin that is generally mild and transient. Do not exceed suggested daily serving. Not for use by individuals under the age of 18 years. Do not use if pregnant or nursing. Keep out of reach of children. Use only as directed. Niacin 20 mg 100%, A Proprietary Blend Containing: 202 mg, Rhodiola rosea (root) Extract, Beta Alanine, Cayenne (fruit) Powder. Other Ingredients: Rice Flour, Corn Starch, Gelatin, Stearic Acid, Silicon Dioxide, Titanium Dioxide, FD&C Red #40, FD&C Blue #1.